Companies are always looking to improve productivity and gain an edge, while still keeping costs low and producing high-quality parts. There are a number of solutions that can help companies reach these goals — from investing in more efficient equipment or welding processes, to improving workflow. The ability to reduce or eliminate the time spent on certain tasks during the welding process — such as cleaning, applying anti-spatter, removing spatter and slag, and post-weld grinding — can provide significant productivity and efficiency benefits. In the right applications, metal-cored wire is among the solutions that can provide productivity and time-saving benefits. 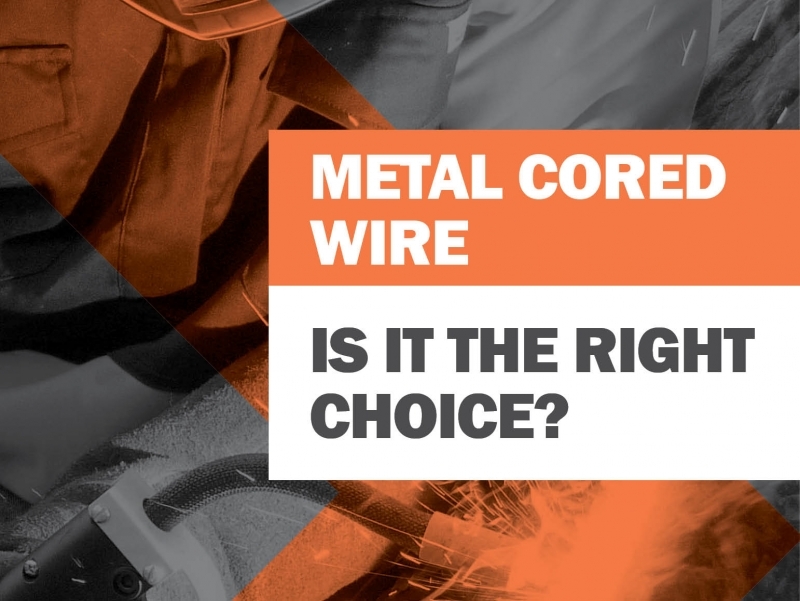 There are some key steps that can help determine if metal-cored wire is the right choice. As with any type of filler metal, metal-cored wire has its own specific characteristics, benefits, limitations and best-suited applications. Because metal-cored wire is a hollow metal sheath filled with metallic powders, alloys and arc stabilizers, it can create distinct results. These include lowering oxidation, providing higher impact strengths and reducing silicon depositions. These characteristics also make metal-cored wire especially suitable for welding through mill scale. When welding with metal-cored wire, the spray transfer process is used. This process creates tiny filler metal droplets that deposit in the weld puddle and generate little to no spatter. Because the current travels through the outside metal sheath, the wire produces a broad, cone-shaped arc. This results in a wider penetration profile compared to the more finger-like penetration of solid wire. This arc shape also creates a wide, consistent bead profile that bridges gaps easily and accurately without burn-through. The construction of metal-cored wire also allows for greater travel speeds and deposition rates, and helps minimize porosity and undercut in the final weld. All of these factors can increase productivity and allow welding operators to weld more efficiently, deposit more weld metal, reduce quality issues and spend less time cleaning the weld. Metal-cored wire is suitable for flat, horizontal, in some cases vertical down welding using a standard constant voltage power source. Vertical up welding is also possible with a power source that provides pulsing capabilities, though it will generally be slower using metal-cored wire compared to flux-cored wire. Metal-cored wire is capable of single or multi-pass welding, and requires high argon shielding gas mixtures (a minimum of 75 percent). Industries such as heavy & mining equipment manufacturing, trailer fabrication, beam & lintel manufacturing, automotive exhaust, chassis and wheel manufacturing, and food and petrochemical fabrication all have welding applications in which metal-cored wire excels. This is due partly to the fact that the wires can be alloyed for most types of steel, from mild and stainless to low alloy. Many of these industries also frequently weld 6mm and thicker material, another application where metal-cored wire offers solid productivity solutions, specifically due to its gap-bridging capabilities. One consideration to keep in mind is that metal-cored wire, on average, costs more per pound than other types of filler metals. However, it can boost productivity that offset the initial cost. While metal-cored wire typically has faster travel speeds and higher deposition rates than other types of wire (especially solid wire), the technology can offer its greatest productivity benefits in the pre- and post-weld phases. In some welding operations, using metal-cored wire eliminates certain pre and post-weld activities such as grinding, sand blasting, applying anti spatter and re-work. This allows the time spent on those tasks to be allocated elsewhere, in ways that can improve the overall productivity of the operation. Since metal-cored wire tends to create little to no spatter and minimizes defects such as undercutting or lack of fusion, post-weld activities such as grinding or chipping spatter usually aren’t necessary, which saves labour time and money. Additionally, reducing the necessary post-weld activity helps increase the flow of completed parts to other stages of production, such as painting or coating, to improve overall productivity. Is it the right solution? When considering any potential change in the welding operation, determining whether metal-cored wire is the best choice will take time. And time can often be hard to spare. If you want to know more about how metal cored wire could help boost productivity, call one of our End Market Specialists and set up a consultation and product demonstration.